Dez has always been a quiet girl, always trying to keep under the radar and unnoticed. Due to a spine defect she has been forced to live with an extremely confining back brace that severely limits her mobility. That brace is the source of her embarrassment and need to hide herself from others. All that changes when she panics after a boy touches her waist, feeling the brace beneath. Throwing her brace aside, she embraces her inner anger at her limitations, and she changes into a Siberian Tiger setting off a chain of events she never could have imagined possible. Ah, young love, it happens so fast and can be all consuming. That is one of the biggest reasons I love YA novels, as the love comes quickly and so much can be overlooked. In adult books, relationships are almost always much slower and quite bogged down by the real world. You just can't love quite the same way as an adult as you did when you were a teenager, because let's face it, life is much more complicated once you have responsibilities and the choices really aren't so black and white anymore. So, it can be really nice to experience that all consuming love again by reading these types of books. Otherkin features a whirlwind romance that feels incredibly real even as the characters question the reality of it themselves. That's not to say everything is full of roses for the pair, as there are plenty of roadblocks along the way that make things rather interesting, especially as they keep secrets from one another. 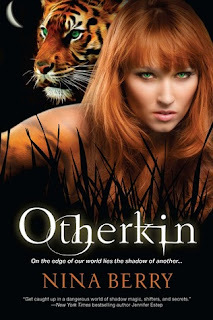 I really loved Otherkin's take on shifters, as I prefer the mythology that makes them born into what they are rather than some disease. It just makes the animal part seem so much more an ingrained part of them as they were always more than human. Even Dez, who had no knowledge of her heritage is still incredibly "one" with her tiger side. I especially liked the way that their animals sides came from a shadow world, allowing them to be two things at once, with either animal or person taking the reigns when necessary. This shadow world added in the element of others who could manipulate those shadows to do good or harm. Of course it is those who would harm that are the opposing force in Otherkin. They are called the Tribunal, and they are almost fanatical in their hatred of the shifters, and their powers remind me very much of evil sorcerers, making them a very real threat. I just kept waiting for the evil cackles to happen whenever they were wreaking their havoc, they were that bad. I'll be glad to see the day when they are finally given a dose of their own medicine, that's for sure. Everything about Otherkin felt fresh and unique, an impressive feat in the genre. In fact, I am so excited about this new series, that I have already added the sequel, Othermoon, due out April 2013 to my most anticipated list. From the rich cast of characters and the incredible new world, to the way it grips you from the very start, Nina Berry's debut novel, Otherkin is not to be missed!